Today is the day that I celebrate one of my favorite albums of all time. 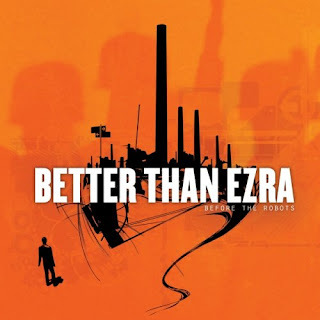 Before the Robots is Better Than Ezra‘s latest studio album, released in May of 2005. It was one of those albums you come across looking for new music and see that one of those fairly popular 90s post-grunge bands is under the new release column. I have always been a big fan of “Good” and “Desperately Wanting” as they were pretty solid rock radio staples in the late 90s. I wasn’t expecting much from the album though I decided to give it a listen. I was actually more excited about the new Oasis album set for the same release date but that turned out to be a huge disappointment as “Don’t Believe the Truth” did not impress me at all. Before the Robots is a great album filled with epic and catchy songs that is capped off with one of my all time favorite songs, “Breathless“. This song is slow moving and very powerful. It is the last song off the album and it’s a great finisher. This is really one of those albums that is almost flawless. Some of the most popular songs on the album are my least favorite like “Juicy” which just feels way out of place when listening to the whole album. “Overcome” and “A Southern Thing” round out my list of least favorite songs. With those songs out of the way, we are left with a great crowning achievement foe the band from New Orleans. The album kicks off with “Burned“, a great song about a love fallen by the wayside. The next is “Daylight“, a powerful song about the a girlfriend that you love to hate, and hate to love, but you can’t seem to get off your mind. “Lifetime“, the third song of the album and their biggest hit off the album, is about letting go and holding on. Next up is “It’s Only Natural“, a fun song about just fooling around and not feeling guilty about it. “Special” is just that, special. This song is just simply fantastic. “American Dream” is a very underrated song about how time flies and how quickly dreams fade away. One of Better than Ezra’s best singles, “Our Last Night“, is coincidentally about that last night with a special someone. “Hollow” is similarly to “American Dream” in that it is a look back at the past and how some things can leave you felling empty. Appropriate for the month of December, “Our Finest Year” is another look back, this time with a hopeful look at the future. It ends of course, with “Breathless” and a great finale to an outstanding album that will have you coming back for more every time you listen to it.